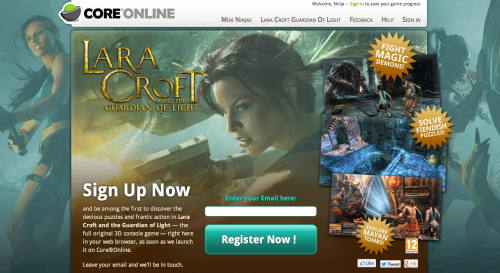 Lara Croft and the Guardian of Light will launch on Google Chrome this fall! Announced at the Google I/O developer conference, GoL takes advantage of Native Client, an open-source tech for running natively compiled code in the browser. Joining Square Enix’s debut Chrome Title - Mini Ninjas - conference attendees were able to play a demo of Guardian of Light at the event. You can expect more Square Enix titles to come to Chrome within the next year. To learn more about GoL on Chrome, visit CoreOnline.com and register for updates! Angelina Jolie in Maleficent Production Shots!